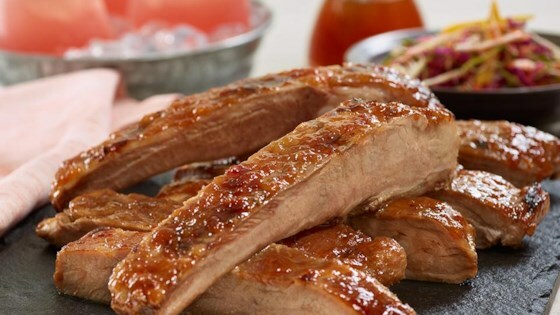 "Peach jam, chili sauce and chipotle hot sauce make a sweet and spicy glaze for these tender, slowly grilled spareribs." Heat charcoal or gas grill for indirect cooking at 230 to 250 degrees F. Add drained wood chips, if using. Place the ribs, meaty side down, over a drip pan and cook for 2 hours. Add about 12 coals to a charcoal grill every 45 minutes or so to maintain the heat. Remove ribs from grill. Double-wrap each rack in heavy-duty aluminum foil. Return wrapped ribs to the grill and cook for 1 1/2 to 2 hours more over indirect heat, until very tender. Add more coals as needed to maintain temperature for a charcoal grill. Meanwhile, make the glaze. Combine all ingredients in small saucepan. Bring to a boil over medium-high heat; reduce heat and simmer 30 minutes, stirring frequently. Remove ribs from grill and unwrap. Place ribs over direct heat on grill and brush with peach glaze. Cook for about 5 minutes until the glaze is set. Turn ribs and repeat with more glaze. Chili sauce, sesame oil, and root beer make sweet, spicy, succulent ribs. Recipe by BBQ Pit Master, Moe Cason.